iTunes is the default audio player in Mac OS X Snow Leopard. In addition to the standard volume controls, iTunes offers a full equalizer. An equalizer permits you to alter the levels of various frequencies in your music, allowing you to boost low sounds, lower high sounds, or anything in between. Now you can customize the way your music sounds and adjust it to your liking. Use the Equalizer sliders to tweak the sound of your music. 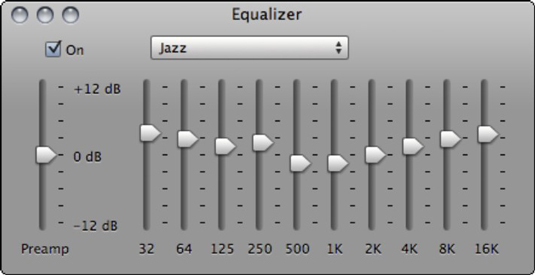 The Equalizer window has an impressive array of 11 sliders. Use the leftmost slider (Preamp) to set the overall level. The remaining sliders represent various frequencies that the human ear can perceive. Setting a slider to a position in the middle of its travel causes that frequency to play back with no change. Move the slider above the midpoint to boost that frequency; conversely, move the slider below the midpoint to reduce the volume of that frequency. Continue adjusting the equalizer sliders until your music sounds the way you like it. When you close the Equalizer window, iTunes remembers your settings until you change them again. 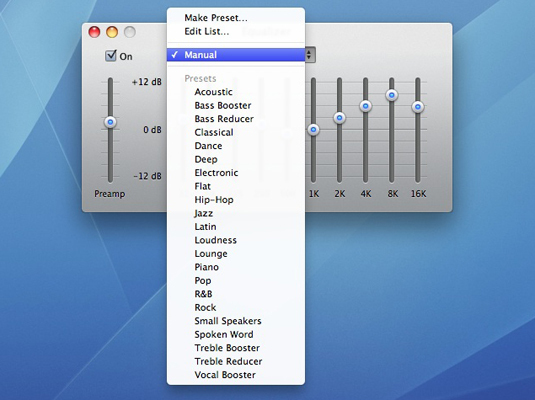 In case you prefer to leave frequencies to the experts, the iTunes Equalizer has several predefined settings to match most musical styles. Click the pop-up menu at the top of the Equalizer window and select a genre. Choose a genre to find a good fit for your favorite music. After you adjust the sound to your satisfaction, close the Equalizer window to return to the iTunes interface and relax with those funky custom notes from James Brown.